Plants annual; taproot slender. Stems erect, simple or branched, slender, to 80 cm, subglabrous to retrorsely puberulent especially proximally, distal internodes frequently glutinous. Leaves 2 per node; blade with margins ciliate toward base, apex acute to obtuse; basal blades oblanceolate, spatulate; cauline narrowly oblanceolate to linear, 1-9 cm × 2-15 mm, scabrous or puberulent, rarely glabrous on both surfaces. 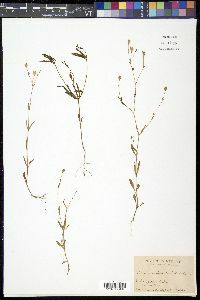 Inflorescences cymose, open, branches usually ascending, several- to many-flowered, 1-flowered in depauperate specimens. Flowers: mature calyx prominently 10-veined, campanulate to ovate, 5-9 × 3-5 mm, margins dentate, glabrous, veins parallel, with pale commissures; lobes usually purple, triangular, acute, ca. 1 mm; petals white, often suffused with dark red, rarely wholly dark red, limb ovate, usually 2-lobed, ca. 2.5 mm, slightly longer than calyx, rarely petals absent, claw narrow, appendages 0.1-0.4 mm; stamens included; styles 3; stigmas included. Capsules equaling calyx, opening by 6 teeth; carpophore less than 1 mm. Seeds dull gray-black, reniform, 0.5-0.8 mm diam., finely papillate. 2n = 24. Flowering spring-late summer. Dry, sandy or gravelly places, roadsides, fields, waste places, open woods, often appearing after burning; 0-2300 m; Alta., B.C., Man., N.B., Ont., Que., Sask. ; Ala., Ariz., Ark., Calif., Colo., Conn., Del., D.C., Fla., Ga., Idaho, Ill., Ind., Iowa, Kans., Ky., La., Maine, Md., Mass., Mich., Minn., Miss., Mo., Mont., Nebr., Nev., N.H., N.J., N.Mex., N.Y., N.C., N.Dak., Ohio, Okla., Oreg., Pa., R.I., S.C., S.Dak., Tenn., Tex., Utah, Vt., Va., Wash., W.Va., Wis., Wyo. ; Mexico; South America; adventive in Europe. The six varieties and forms of Silene antirrhina noted above were named on the basis of stature and flower color, but none appear to be worthy of recognition. The species is very plastic, being greatly affected by moisture, exposure, and nutrients. Annual herb with a slender taproot 20 cm - 0.8 m tall Stem: slender, upright, unbranched or branched, nearly hairless to minutely hairy, upper internodes often sticky. Inflorescence: a branched, open cluster (cyme) of several to many flowers. Flowers: white, often reddish. Stalk upright. Stamens ten. Styles three. Sepals: fused at the base into a tube (calyx). Calyx tube 4 - 9 mm long, 3 - 5 mm wide, bell- to egg-shaped, ten-veined, with five short lobes. Lobes usually purple, about 1 mm long, and triangular with a pointed tip. Petals: five, white, often reddish, slightly longer than the calyx, egg-shaped, narrowly clawed, two-lobed. Fruit: a dehiscent capsule, three-chambered, opening by six teeth, 4 - 10 mm long, equal to calyx. Seeds dull grayish black, kidney-shaped, roughened. Basal leaves: reverse lance-shaped to spatula-shaped. 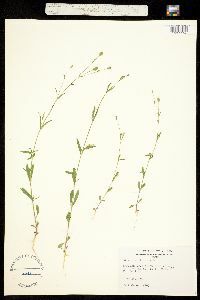 Stem leaves: opposite, two per node, stalkless, 1 - 9 cm long, 2 - 15 mm wide, narrowly reverse lance-shaped to linear with a blunt to pointed tip, rough or minutely hairy, fringed with hairs near the base. Habitat and ecology: Locally abundant in sandy, disturbed soils. Also found in sand barrens and along railroads. Etymology: Silene probably comes from the Greek word sialon, meaning saliva, referring to the sticky secretion on many of these plants. It may also have come from the word seilenos, referable to Silenus-a foam-covered, drunken character in Greek Mythology. This species is variable. It prefers a very sandy habitat and is frequent in railroad ballast throughout the state. It is less frequent in fallow and cultivated fields, pastures, and waste places and along roadsides. Our manuals give this species as a native of the United States. I do not believe, however, that it was a native of Indiana. Our earliest authors either do not list it or give it as a plant of waste places. M'Murtrie, who published a flora of Louisville in 1819, does not list it, nor does Riddell, who published his "Flora of the Western States" in 1835. Short, Peter & Griswold published a catalogue of the plants of Kentucky in 1833, and they do not list it. Neither do they list it in any of their four supplements, the last published in 1840. Lapham lists it from Illinois in his flora published in 1857. Dr. Clapp records that he found it in 1835 east of Corydon and in the "barrens." Young, in his catalogue of the plants of Jefferson County published in 1871, does not list it. J. M. Coulter, however, reports it in his catalogue published four years later. Schneck, who published a flora of the Lower Wabash Valley in 1876, says: "In poor grounds anong cereals, common." Bradner, Phinney, and Van Gorder did not report it in their floras. Apparently it has become a frequent weed during the past 50 years. I believe it has been introduced mostly in grass and grain seed and by railroads. 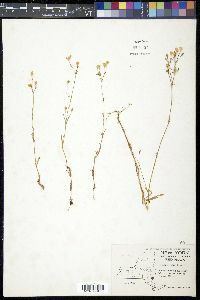 A form with the internodes lacking the glutinous band is known as f. deaneana Fern. 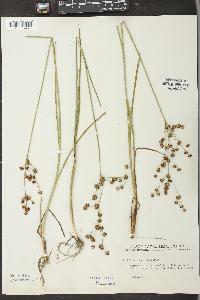 It occurs with the species and I found it in Posey County associated with the species and the variety [var. divaricata]. [Variety divaricata, a taxon with thinner leaves and more widely spreading inflorescence,] has been reported from the dune area by Peattie. Evidently local and rare in the state. I have it from Kosciusko and Warrick Counties. Annual, 2-8 dm, often puberulent below, glabrous above except usually for some glutinous bands below the upper nodes; basal lvs oblanceolate to spatulate; cauline lvs oblanceolate to linear, 3-6 cm נ9-12 mm, the margins ciliate near the base; infl open; fls mostly ±numerous; cal 4-10 mm, 10-nerved; pet white or pink, equaling or exceeding the cal, 2-lobed, or obsolete, the appendages minute or none; carpophore 1 mm; fr 4-10 mm, 3-locular; seeds 0.5-0.8 mm wide, papillate; 2n=24. Sandy soil and waste places, through the U.S. and s. Can., apparently native. Summer.